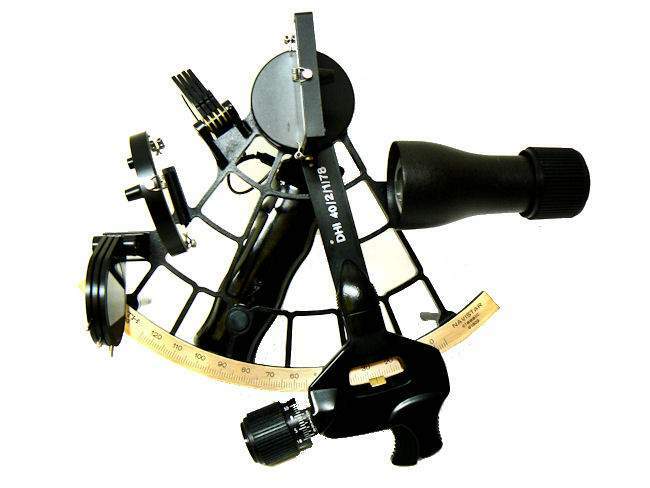 To see our current inventory of high quality premium sextants, click here! We are the premier source for all versions of the Plath Navistar premium sextants and have sold more than any other dealer in the world! We sold our last C. Plath Navistar Royal sextant Christmas, 2010, and have just replaced it with a Navistar Classic in like new condition. We only sell those that meet our standards for being in 5 Star Mint condition. 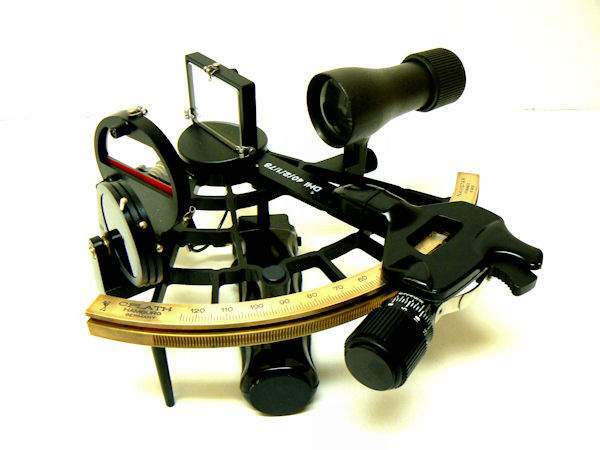 These instruments were made in limited quantities, are rare, hard to find, and very much in demand by discriminating collectors and maritime industry professionals who still practice the art of celestial navigation. This time we have one that has been owned by the same person for almost 30 years and has never been used. It's perfect condition substantiates that claim. 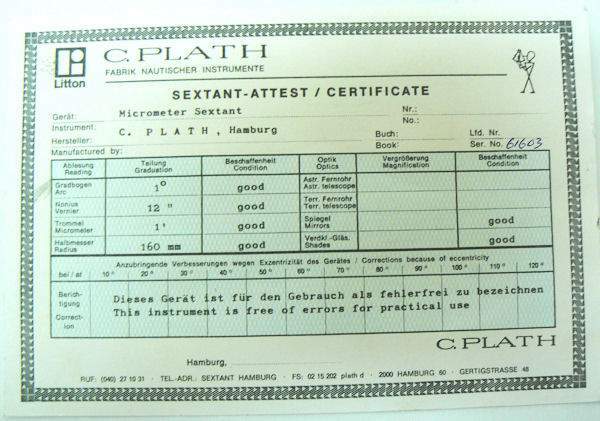 There is an undated Plath instrument certificate with this instrument, but no manual. We have tested it thoroughly and can guarantee it is in perfect condition with ZERO index error. and only a smidgen of side error which is preferred. Based on our proprietary register of C. Plath instruments we can also date it by its serial number 61603, as being made in 1978. 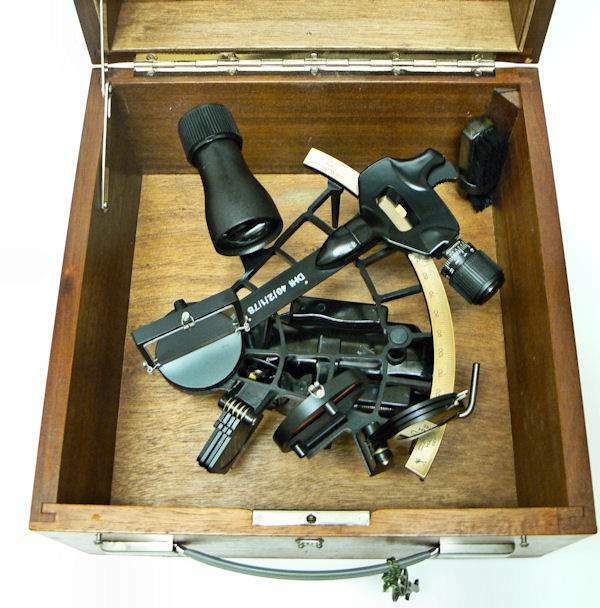 It has a Mahogany wood case with the older style black Bakelite claw grip in operating condition. The index arm carries the Deutche Hydrographic Institute seal of approval which indicates this instrument was tested by DHI, and found to meet the more stringent standards for commercial use. Hence, this sextant sold for more originally then the regular Navistar Classic. Until the introduction of the Royal in 1990, the Navistar Classic was the top of the Plath line and both were made in limited quantities. It and the Royal were made with a guaranteed non-adjustable instrument error of 10 arc seconds or less. During most of it's production, it sold for a premium over all Plath's other sextants. For example, almost 30 years ago, they sold for over $1000.00, and as recently as 2001, the price had risen to $4000.00. Don't confuse this model with the similarly named “Navistar Professional“ which. 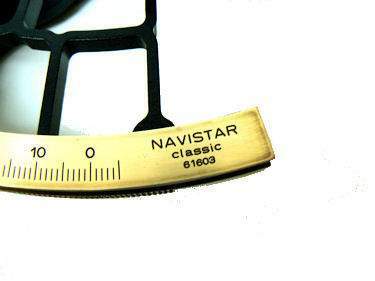 in our opinion is the worst sextant made by Plath or the “Navistar Traditional“ which was made shortly before sextant production ended. That instrument has nonadjustable error up to 20 arc seconds. The Navistar brand imprint on the left arc. The vernier has six indents and reads to 10 seconds of arc. Has an instruction booklet, and Plath's certification with matching numbers. The higher grade Navistar's have the imprint of the Deutche Hydrographic Institute dated 2/1/78 certifying them for commercial service. All these features are present with this instrument except the instruction booklet. PROVENANCE: This instrument was formerly the property of a yachtsman who owned a Swan 37 back in the early 1980's, but who never took up the study of celestial navigation. He just thought he should have a sextant that was equal in quality to his Swan. For the seven year period from 1978 through 1985 only 1693 Navistar Classics were made. That is only 211 per year to satisfy worldwide demand. 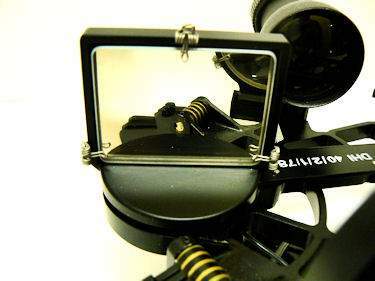 CONDITION: The split image horizon mirror and the index mirror both are in “new condition“. The stainless and chrome fittings are all bright and shiny. There no evidence of use of the sextant. The frame's paint is unblemished. The case has a some minor scuff marks, and scratches on its bottom and a few elsewhere. The lighting works. The connection has been helped by a shim to assure contact. This is true of most C. Plath sextants, and many have a nonworking light. There is no manual. The original certificate of inspection is included, but undated. There is no index error and only a smidgen of side error which is a good thing. It operates like a well oiled piece of machinery, and has no mechanical faults. This C. Plath Navistar Classic requires someone who can appreciate the fine points of a sextant, and is willing to pay an appropriate price for this level of quality and excellence. It is suitable for a collector or for use at sea . QUALIFICATIONS: We are one of the few company's still selling navigation instruments that know anything about them. For purposes of judging whether Joel's opinion counts, he was the editor of the chapter on sextants of the 1977 Edition of "Bowditch", The American Practical Navigator, NAVPUB 9; a member of the U.S. Naval Academy Navigation Symposium Board, 1975 -1978; the author of a book on marine sextants, Cornell Maritime Press,1975, and the founding president of Nautech Maritime Corporation which partnered with Tamaya of Japan in the introduction of the MS 733 Spica, the MS 833, Jupiter, MS 933 Venus sextants and the famous NC-2 navigation computer, in the U.S. market. Joel is a retired Master Mariner, and held a U.S. Navy "D" Qualification as a Senior Skipper - Oceans. For six years he was a Varsity Offshore Sailing Team Coach at the U.S. Naval Academy. In 1962 C.Plath was acquired by Litton Industries, a large American concern.The C.Plath North American Division was set up in 1978 in College Park near Washington. 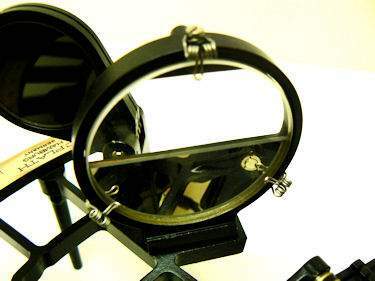 1996 saw the introduction of the world's first fiber-optic solid-state gyrocompass by C.Plath. 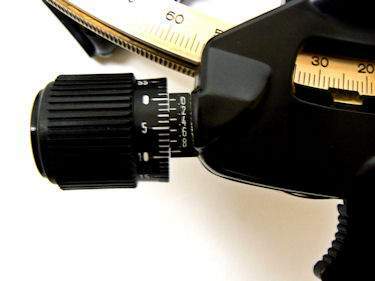 The first ever gyrocompass with no moving parts. Sperry Marine was formed in 1997 with the combination of C.Plath, Decca Marine and Sperry Marine with more organizational changes yet to come. After 163 years, C.Plath changes its name to Sperry Marine in May 2000. In 2001 Sperry Marine becomes part of the Northrop Grumman Corporation. Directly thereafter, C. Plath quit producing sextants. The parent company has completely liquidated everything including machinery, equipment and spare parts. International buyers welcome, but must inquire first. We have satisfied customers in Argentina, Australia, Austria, Belgium, Bermuda, British Virgin Islands, Canada, Chile, China, Czech Republic, Democratic Republic of Congo, Denmark, Estonia, England, France, Germany, Greece, Holland, Hong Kong, Hungary, Iceland, Ireland, Israel, Italy, Japan, Kuwait, Latvia, Luxembourg, Martinique, Mexico, New Zealand, Norway, Nova Scotia, Panama, Poland, Portugal, Puerto Rico, Romania, Saudi Arabia, Scotland, Singapore, Spain, St. Maarten, Sweden, Switzerland, Thailand, Turkey, United Arab Emirates, USVI and the Eastern Caribbean. ACCEPTED FORMS OF PAYMENT are Bank wire transfer, cashier's check, or personal check in which case the item will be held until cleared. No checks from overseas buyers, no credit cards or PayPal accepted on this item. This is the 14th Navistar we have offered since 2003. In our opinion, they are the finest of the contemporary sextants. They will be equally desirable at sea or in a collection of only the finest.